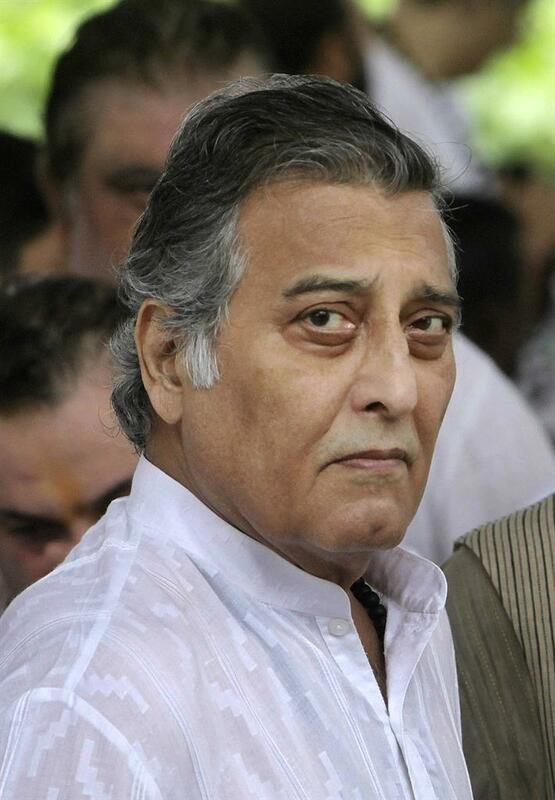 Vinod Khanna, a dashing Bollywood actor turned politician, has died of cancer, a hospital official said. He was 70. Tushar Pania, a spokesman for Sir HN Reliance Foundation Hospital, said Khanna died Thursday due to bladder carcinoma. Khanna made his Bollywood debut in 1968 and acted in more than 100 films. His popular performances included "Mere Apne" (My Own), "Mera Gaon Mera Desh" (My Village, My Country), "Gaddaar" (Traitor), "Kachhe Dhaage" (Delicate Thread) and "Amar Akbar Anthony." He acted with top stars Amitabh Bachhan and Dharmendra in several Hindi movies. In 1982, Khanna temporarily quit the film industry to join spiritual guru Bhagwan Shree Rajneesh. He resumed his film career after five years. He entered politics in 1997 as a lawmaker with the Hindu nationalist Bharatiya Janata Party, representing the Gurdaspur constituency in northern Punjab state in Parliament. He also served as junior external affairs minister and culture and tourism minister. He married his first wife, Geetanjali, in 1971 and the two had two sons, Rahul Khanna and Akshaye Khanna, who also became Bollywood actors. The marriage ended in a divorce, and he married his second wife, Kavita, in 1990. They had two children, a son and a daughter. 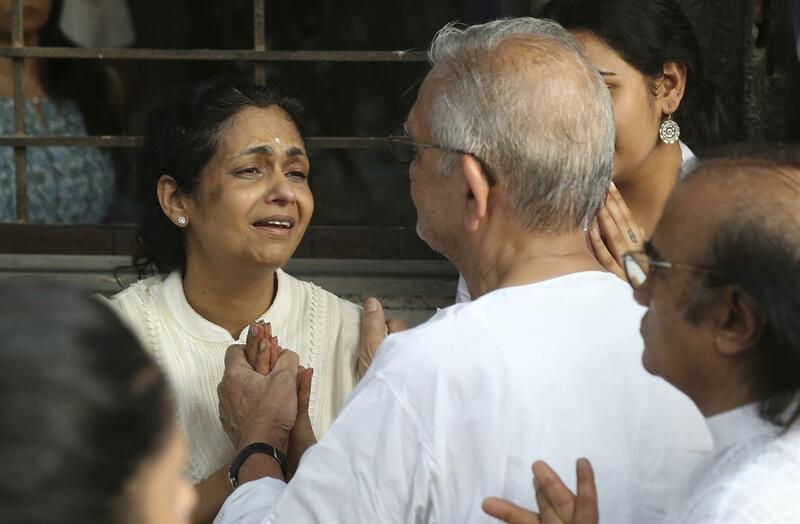 Kavita Khanna, wife of Bollywood actor turned politician Vinod Khanna is consoled by Indian film maker and poet Gulzar, back to camera during Khanna's funeral in Mumbai, India, Thursday, April 27, 2017. Khanna died of cancer on Thursday, a hospital official said. He was 70. 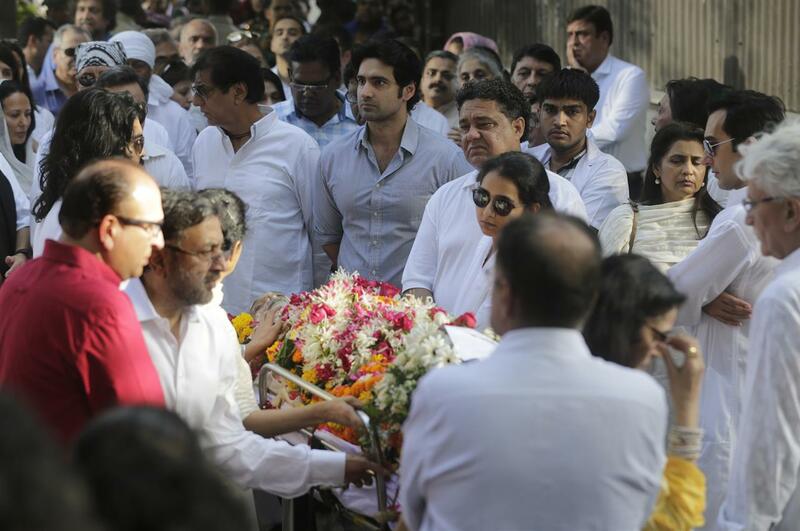 Friends and relatives carry the body of the Bollywood actor turned politician Vinod Khanna during his funeral in Mumbai, India, Thursday, April 27, 2017. Khanna died of cancer on Thursday, a hospital official said. He was 70. 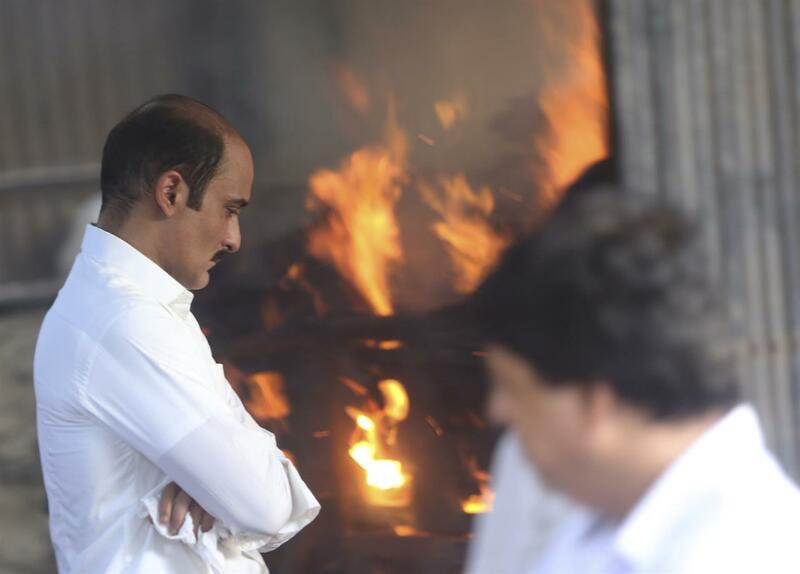 Bollywood actor Akshaye Khanna, left, son of Bollywood actor turned politician Vinod Khanna stands near his father's funeral pyre in Mumbai, India, Thursday, April 27, 2017. Khanna died of cancer on Thursday, a hospital official said. He was 70. 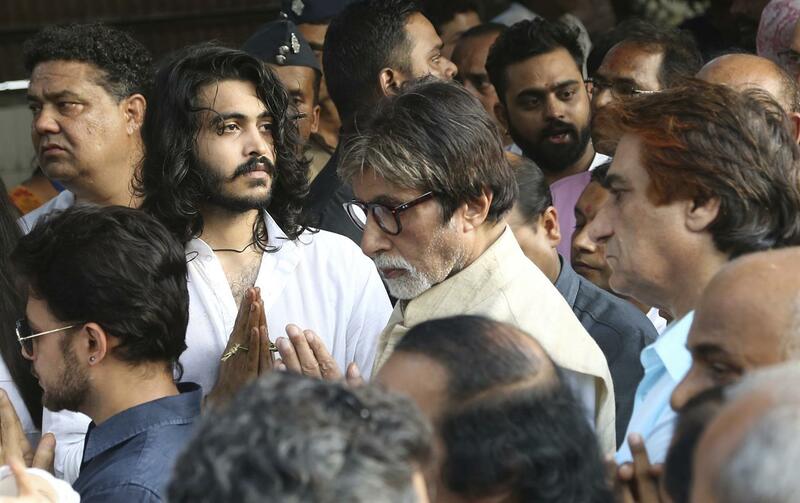 Bollywood actor Amitabh Bachchan, center, greets Sakshi Khanna in white, son of the Bollywood actor turned politician Vinod Khanna during Khanna's funeral in Mumbai, India, Thursday, April 27, 2017. Khanna died of cancer on Thursday, a hospital official said. He was 70. 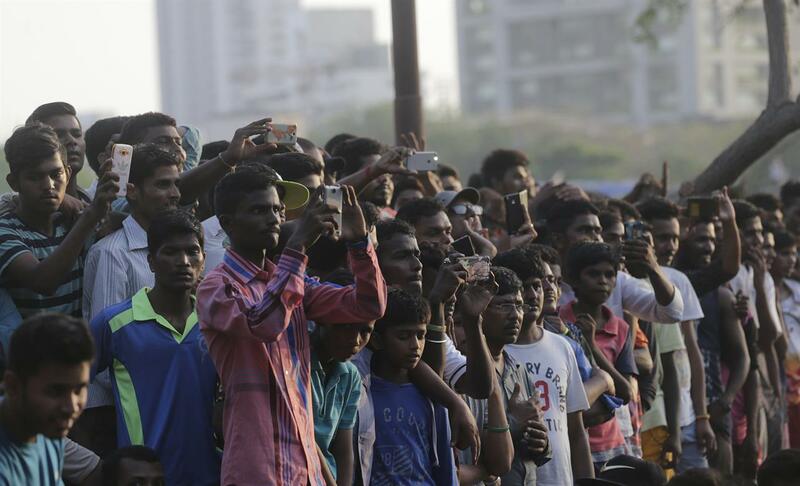 People take pictures as they watch the funeral of the Bollywood actor turned politician Vinod Khanna in Mumbai, India, Thursday, April 27, 2017. Khanna died of cancer on Thursday, a hospital official said. He was 70.